The MRS label released ‘The Complete ‘50s Movie Masters & Alternate Recordings’ for Record Store Day 2019. Yesterday was a real treat for this Elvis fan as not only did the postman deliver my FTD ‘Fun In Acapulco’ Deluxe set but also CMT’s ‘Ghetto Power: Spliced Takes’ and, with perfect timing for Record Store Day, the two new VINYL releases from the MRS label. I love VINYL. I bought my first Elvis 45rpm aged six. There is still something special about the tactile feel of real music pressed into something physical , the wonderful ability for spinning plastic to pump out a HUGE sound from the tiny diamond stylus, the printed sleeves and readable print. No wonder Millennials are so fascinated and retail shops have seen a major return to quality vinyl for sale. Unfortunately with the convenience of streaming or CDs that last 80 minutes, nowadays I tend to only purchase vinyl that offers something new and interesting. The last time I bought an Elvis fifties movie soundtrack on vinyl was in fact a second-hand 'Loving You EPA 1515 Vol.1' which featured the track ‘True Love’ noting “Not from Loving You” which I thought quite amusing. I can still recall the crackle & pop of the vintage spinning 45rpm. I still own my copy of Elvis‘ original ‘Love Me Tender’ with my main interest being the flip-side ‘Anyway You Want Me’ which truly bristled with over-equalised top-end and piles of compression. The 1956 45rpm noted “New Orthophonic High Fidelity” yet sounded like hissy over-compressed low-fi! 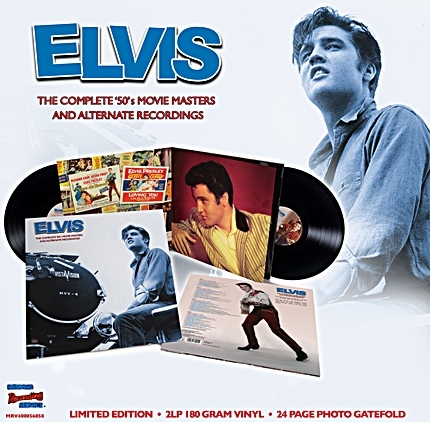 Released to coincide with Record Store Day 2019 MRS’ ‘The Complete ‘50s Movie Masters & Alternate Recordings’ features one side of vinyl dedicated to each one of Elvis' four 1950s movies. We get ‘Love Me Tender’ on one side with 7 tracks, ‘Loving You’ fitting nicely onto Side B, ‘Jailhouse Rock’ as a sensational Side C and to my surprise all of ‘King Creole’ fitting neatly into the final side and with a cool Bonus Track not on the original RCA vinyl. The MRS presentation even dwarfs the FTD 7' Classic Album releases. AUDIO QUALITY: My first impression is what a SENSATIONAL sound it has for vinyl. The use of MRS’ Studio Ds remasters – lovely warm sound with some added compression – really works for vinyl. I played my partner (no great Elvis fan but true audiophile!) the first track ‘Love Me Tender’ and she was blown away by the volume I could crank it up to (without any rumble) and the overall quality of the sound. Lovely warm bass yet really clear top end. Sure beats that crackly old 45rpm of mine. Perhaps the real attraction (apart from Elvis singing!) is the fabulous 24 page photo-spread. 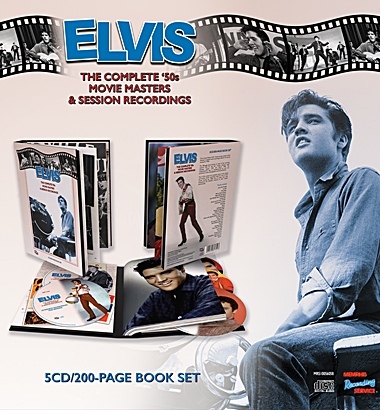 Being “album size” this photo-book - with 6 pages dedicated to each 1950’s movie – features some truly amazing photos of Elvis in a stunning format. Compared to a regular CD, or even FTD’s “Classic Album” 45rpm size, these pages truly impress. Below are a few pages just to give fans an idea of the remarkable size and design. Side 1 – Love Me Tender . I cannot remember this ever being out on an LP before – after all it was only four tracks. Here MRS add two alternate takes, ‘Let Me’ and ‘We're Gonna Move’, plus the cute ‘Love Me Tender - End Title version’ which takes the side to over 15 minutes. While purists may not like the idea of the tracks being STEREO they sure sound fine to me. Compared to a regular CD release the format is a stunning size. Side 3 – Jailhouse Rock. The original six tracks complemented with five bonus tracks. Great to have an additional ‘(You're So Square) Baby I Don't Care’ (great remastering from MRS on this track) and a STEREO ‘Jailhouse Rock’. For me the all-too-short 14 seconds of ‘Don't Leave Me Now Movie Set Version’ works on a lengthy CD compile but is only frustrating here and could have been left off. The ‘Young and Beautiful’ End Title version as the final track more than makes up for this and it is such a perfect end for the album. Note that the sleeve says ‘Baby I Don't Care Movie Edit’ is Stereo when it is in fact Binaural. Again comparing the format to the regular 'King Creole' CD release. What a cracker original album and I am surprised that it all fits on one side of vinyl and yet still sounds quite fine cranked up loud with no background rumble. 25 minutes of New Orleans joy and the nice bonus here being the final treat of the ‘Crawfish Movie Master’. a stylish touch is that each LP label features a cool image from each 1950s movie. Overall Verdict: While I expected good things for both of these MRS 2019 Record Store Day releases I was truly stunned by the overall presentation as well as the quality of the audio. Of course having Elvis sing such great fifties classics sure helps! Listening to the whole set makes one realise how low the quality of Elvis’ movie songs dropped once he came back from the army. RCA should have paid Leiber / Stoller to keep supervising Elvis’ movie soundtracks. Supplying a 24-page massive photo-album as an insert raises the bar for other vinyl releases and makes this a true collectable. Vinyl fans will have to search their Elvis Dealers for copies as MRS state that they are already out-of-stock! Please note that these images are only personal photos and so cannot show the true quality of the images. 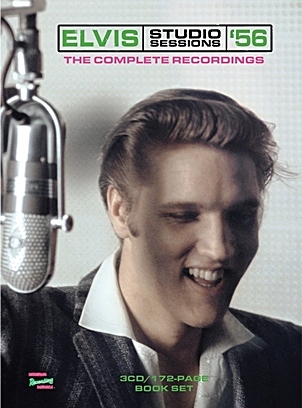 'The Complete ‘50s Movie Masters And Session Recordings' In-Depth CD/ Book Review: This MRS 'The Complete ‘50s Movie Masters And Session Recordings' 5CD/Book combo pays tribute to Elvis Presley’s complete music recordings made for his movies during the 1950s.